Pellerin Milnor’s 48040 F-Series 275 lb. 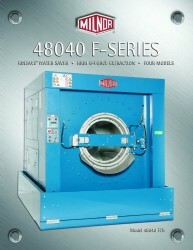 (125 kg) capacity washer-extractors are available in four models (48040 F7J, 48040 F7B, 48040 F7Z, and 48040 F7D). Available in stationary and two-way tilt with either E-P Plus® or MilTouch™ controls, the 48040 F-Series is ideal for any commercial laundry. The tilting models (48040 F7B and 48040 F7D) provide optimal ergonomics and efficiency loading and unloading of goods. The washer’s load angle (12°) allows for goods to be loaded quickly, without falling out of the washer. The unload angle (12°) gravity assists the goods to fall forward to a waiting cart or conveyor. Another benefit to this series is its lower profile, which is ideal for laundries with low ceiling clearance. The 48040 is an excellent choice for dust control and uniform laundries. This 300 G washer-extractor has two highly programmable control options and 16 liquid supply ports, both of which allow for more flexibility for use. Milnor also offers the non-tilt 48040 F7J and 48040 F7Z.